Smart Weston - a Memory of Romford. I remember very well the giant tennis racket outside of Wards Sports. A little further down was a menswear shop Smart Westons, and what was the name of the coffee bar that was near to both of these shops? 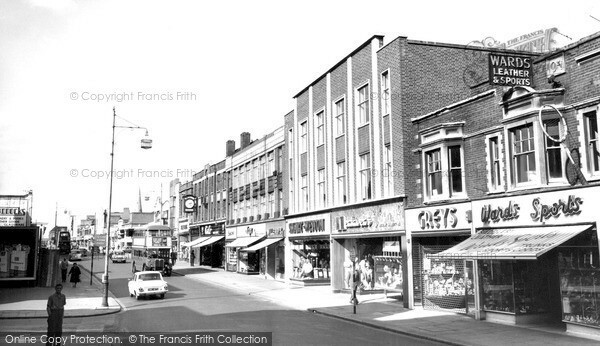 Romford was a clean, and enjoyable place to shop in those days. To see it now is very depressing. A memory shared by Lord Andrew Grahamme Morris on Feb 26th, 2011. Send Lord Andrew Grahamme Morris a message. Does anybody have apic of the front of smart Weston ? roger.mills, Hi Roger you were very close regarding the name of the coffee bar, it was called Sherrys and was a regular haunt for me and my friends in the 1950`s. I remember the singer Frankie Vaughan calling in there on a Sunday afternoon for a coffee after or before appearing in concert across the road at the Odeon Cinema. Had some enjoyable times in there, and so so glad to have lived in that era,its a bit different these days. Add a memory of Romford.